With so many documentaries becoming an instant hit, it is clear that true crime is more popular than ever. I have been a long time listener of podcast, Sword and Scale, which gives me my true crime fix once a fortnight. Hosted by Mike Boudet, it is well researched and covers many different facets of true crime. 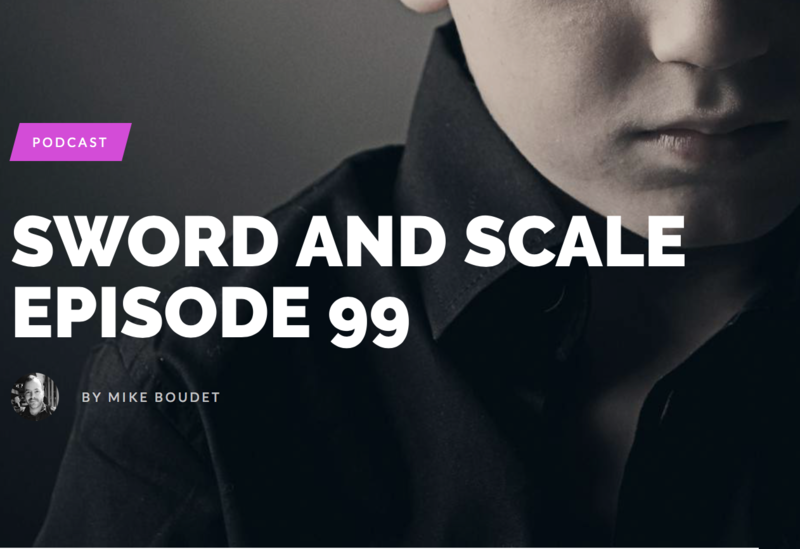 From episodes on serial killers, cold cases, and current court proceedings to those focusing on views of capital punishment or living a day in the life of an emergency responder, Sword and Scale is a true crime fan’s paradise. The most recent episode, episode 99, focused on male survivors of child sexual abuse. Recognising that this is often underreported and kept hidden, Mike reached out to these individuals and offered them the chance to share their story as well as looking at how it has continued to affect their adult lives. He hopes that through exposing this widespread problem, it will help others to come forward and speak up. This story, like some of the other episodes, is not for the faint hearted. The men being interviewed share what happened to them, at times in quite graphic detail. Mike often encourages the interviewees to seek support or talk to a therapist: however, there were concerns about the stigma attached to doing this. This was particularly poignant for me: as a psychologist who works with young people who have had similar experiences, I can say that I never pass judgement about those who share these experiences with me. However, from what the interviewees share, it is clear to see how victims may be held back from doing this. Mike also seeks the opinions of professionals on some of his episodes. Clinical Psychologist Dr Chad Lewing shed some light on the long-lasting effects of abuse as well as statistics, although it might have been beneficial to have more information on how to help victims of abuse. The highlight of the episode for me was the interview with former FBI agent, Jim Clemente. He spoke about his own experience of abuse as a teenager and his involvement in the case to apprehend his own abuser later in his life. He suggests this led to him pursuing a career in the FBI, specialising in Child Sexual Victimisation. In contrast with some of the earlier interviews in the episode, it was hopeful to see that there are positive outcomes for some victims of abuse. Although I am a fan of the podcast and I enjoy the variety of topics the episodes cover, the host has come under some criticism most recently for his apparent lack of empathy towards individuals he has on the show. I have to disagree with this – I feel that there is a good focus on the victims discussed without glorifying the crimes or perpetrators. I was hooked from the first episode and I continue to be an avid listener. - Angela Deegan is an Assistant Psychologist.